Kissed by the Moon Cloth Diaper Mail Round 2! This post has been revised after being contacted and served excellent customer service from Kissed by the Moon. I recently made by first purchase from a company called Kissed by the Moon. KBTM sells everything you could possibly need/want as a new mama in search of more natural options for your baby. They sell toys, baby carriers, cloth diapers, teething goodies, breastfeeding essentials, bath and body, etc. I have heard great things about this store and was dying to buy some diapers from them. After finding out that we are expecting a little girl at the end of August, I just HAD to get some girly cloth diapers! So exciting! I knew about this great program that KBTM does, called Mystery Fluff. It's a program where you spend a certain amount of money, and then receive a "mystery" collection of diapers for a little bit cheaper than you would have paid. It's such a cool idea, and I've seen great reviews on families receiving awesome cloth from them, and it's fun to try things you would have not bought on your own - and of course even better when you fall in love with the diapers they send you. To try to save even more money, I decided to do the Loved Mystery Fluff option. It's an option where you get "loved" or "used" diapers that should be in excellent or very good used condition, so you get even more money's worth than what you spend. So I spent $50 and very [im]patiently awaited the arrival of some loved mystery fluff that should be worth at least $62! 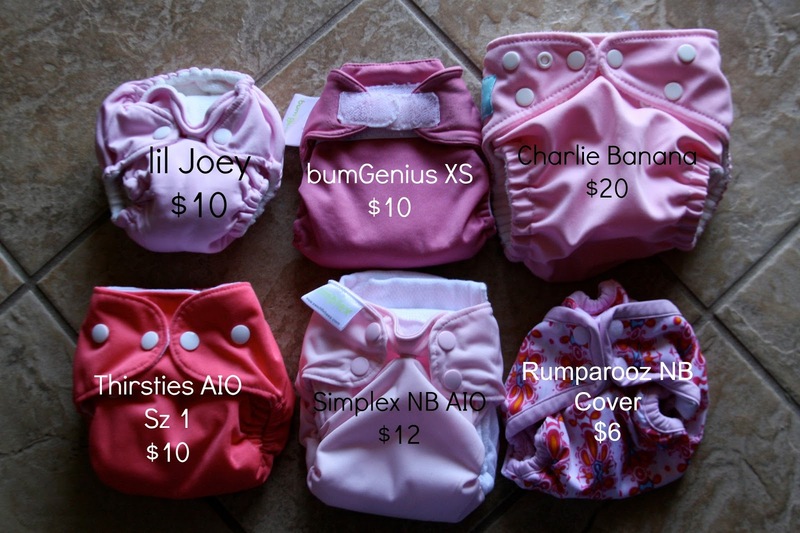 All in all, it looks like the total for all six diapers would be $68. The price works out to be even more than what KBTM says they will do for $50! I made my second "fluff mail" video when I received the diapers last night. I could NOT wait to see what I got, and it's really so much fun to get mystery diapers! I am so thrilled with the replacement "loved" diapers that I received, as you can see in the video above. I can't thank Tami from Kissed by the Moon enough! What a wonderfully thoughtful and kind owner to do everything she can to make her customers satisfied and happy!